Rivals.com reports UMass has offered to Jordan Davis, a 6-1, 193 pd Safety from Tampa,FL. This article mentions the UMass offer. Davis is featured in an article here. This page mentions the UMass offer. 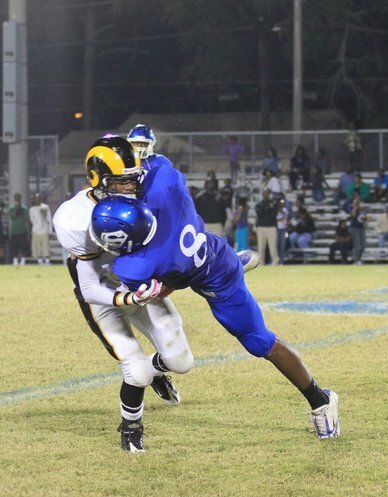 Besides UMass, Davis holds offers from FBS teams Florida International, UAB and North Texas. Tennessee State and Youngstown State have offered from FCS. ESPN lists Patriot free agents including Chris Koepplin. Which FCS opponent will upset an ACC team this year? Mentions UMass. The Virginia Times looks at William & Mary, the CAA coach's pick for #1 in the league. Related item: The Tribe is ignoring preseason polls. This article looks at new Indiana HC Kevin Wilson's task at winning at a "basketball school"
If you're an Apple person, there is a FCS stats app available for free. CBS Sports has the top 1000+ NFL draft prospects. I found Emil Igwenagu ranked #16 in fullbacks(H-back). I couldn't locate Tyler Holmes or Jonathan Hernandez, but I didn't have much time to play with the site. The UMass website has added video interviews with Tyler Holmes and Julian Talley to the CAA Media Day section. * or the start of a two-for-one series on the road, in which the Minutemen would travel to an opponent twice and have that team play in Foxborough once." UMass opens next year with UConn and Indiana. We are not likely to win either game. In addition, the Minutemen should be underdogs to all conference games in the first year in FBS. It might be nice to add a 12th game against a FCS team at McGuirk, so we won't have the potential for an eleven-loss season. This year is the last for Rhode Island in the CAA. The Rams want to make it a good one. 2011 should be the only time UMass plays Old Dominion. The Monarchs went 17-5 in their first two years in football. The Virginia Times-dispatch says Old Dominion is looking to roar in their first season in the CAA. The FCS Championship game will be January 7th, 2012. Dallas strip clubs rejoice now that the Cowboys are opening camp. Articles on UMass' home game with Big Ten opponent Indiana from MassLive's Jeff Thomas and the Gazette's Matty V. The UMass athletic dept has an article here. 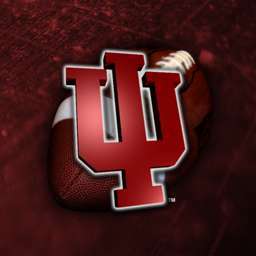 BTW, Indiana has the recruiting coup of the year as they just signed the #1 QB in nation---- Gunner Kiel. Minutemen fans will probably see him at Gillette. 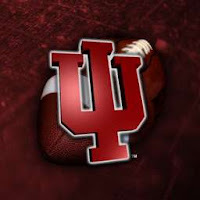 CBS Eye-on-Recruiting has another article on Gunner (great name for a QB) Kiel signing with the Hoosiers. Matty also reports the Patriots signed former UMass Kicker Chris Koepplin to a free agent contract. The Sun Chronicle has a story on the Patriots' free agents and mentions Koepplin. The Enterprise News reports on Greg Niland's signing with the Cardinals and has an image of him in a Northeastern jersey. ArizonaFamily.com also mentions him in a story on the Cardinals free agents. The UMass website has video from the CAA Media Day with clips from Coach Morris and Tyler Holmes. The Richmond Times-Dispatch has some notes from the CAA's Media Day. MassLive has a story on UMass getting ready for their final year in the CAA. Note that Coach Morris is quoted as saying Bowling Green transfer Kellen Pagel in the lead for starting QB. TSN has an an article about Villanova's decision is huge for the CAA. Key quote from coach Talley "Villanova coach Andy Talley said. "We were (recruiting) with a number of I-A players initially and then once the Big East decided to continue to do more study, we lost those kids. And now we're back to recruiting pretty solid I-AA players." Phil Steele has his UMass preview page up. Do the free pdf download before he pulls it. UPDATE: UMass and Indiana sign home and home series starting next year and finishing in 2017. A Big Ten team is coming to our house. Soon. More from the Hoosiers web site. The "Cincy Jungle" blog says Northeastern's John Griffin signed with the Bengals. The Worcester Telegram has an article about Griffin's signing here. Matty V. has the story here. Josh Buchanan has a "Small School" free agent tracking list here (updated frequently). Delaware QB Pat Devlin signed with the Dolphins. Boston College LB Mark Herzlich signed with the NY Giants. MassLive has a story from the MAC Media Day with quotes from UMass AD John McCutcheon on the Minutemen's move to the MAC. FoxSports Ohio on high goals and unique paths for MAC football (mentions UMass). The CAA blogger has a post featuring Julian Talley and Tyler Holmes. The CAA also announced their 2011 TV package. Members of the UMass diaspora will have four opportunities to see Minuteman football. Matty V. reports UMass was picked 5th in the CAA preseaon poll. That's three spots higher than last year. UMass had one first place vote. The CAA's Media Day is today and will be broadcast on ESPN 3. Another mention of UMass' presence at the MAC's Media Day. The high points of the new NFL contract. Free agents can sign Tuesday. I forgot to link to Matty V's story about Greg Niland's wait for an offer. The CAA's Media Day is tomorrow and the League has a Media Day Central on it's website. UMass fans will get to see Rhode Island's new helmet and uniforms at the September 17th at McGuirk. At the ACC's Media Day, Boston College was picked fourth in the ACC's Atlantic Division. Phil Steele also picks BC 4th in his College Football magazine. The Eagles Montel Harris was picked as the ACC's Preseason Player of the Year. The UMass defense should see a heavy dose of Harris when we play on September 24th. 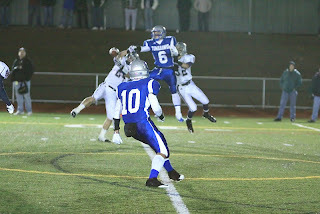 SuperPrep.com reports that J.J. Jolaoso a 5-9 athlete from Attleboro, MA will visit UMass on July 29th. He's also attending camps at Boston College and Temple. Don Brown gets several mentions in this Hartford Courant article on UConn's use of social media for recruiting. "Eagle in Atlanta" Blog has an image showing Boston College's new uniform jerseys. I watched the Montreal Alouettes lose to Saskatchewan 24-27 last night. Brandon London had 3 catches for 41 yards. The game featured some sloppy play by both sides. As I mentioned yesterday, the CAA has their press guide available on their website. This pdf download has the 2011 Preseason All-CAA player list. Included are Julian Talley and Tyler Holmes as Defensive Player-of-the-Year. The most notable omission for UMass is Jonathan Hernandez. I thought Josh Samuda and Nick Speller from the league's top offense were worthy also. Matty V. has a story on Tyler Holmes being named Defensive Player-of-the-Year. Delaware has only ten returning starters this year and it seems six of the the ten are All-CAA. TSN/FatHead.com has a Preseason All-America list up. Tyler Holmes is one of 10 CAA players to make the list. The CAA, which annually rates as near or at the top of FCS, is third in number of players on TSN's list. CSN has a preview of the NEC Conference up. It seems as if every time we play a NEC team, they are the conference champions. 2011 continues the the trend as CSN picks the Blue Devils to win the league. BTW, the CCSU website is here. The Draft Daddy Blog had this link looking at the high school recruiting ratings of the players chosen in the 2011 NFL draft. Tyler Holmes, Julian Talley, Jonathan Hernandez and Nick Speller have been named to Phil Steele's preseason All-CAA team. The 2011 CAA Media Guide is up. 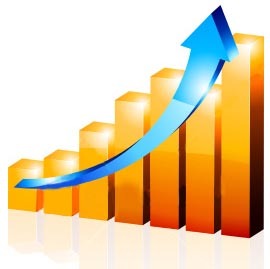 Keepers College Football Ratings site has a page with power ratings adjustments for 2011. Maine is up and Villanova, UNH and Delaware are down. We miss William & Mary this year in the CAA's schedule rotation. That may be a good thing as several publications have them #1 in the preseason rankings. The MAC's football Media Day is July 26th. Meanwhile, Maryland's athletic dept is drowning in debt. Bloomberg Business Week says while the NFL fiddles, college football gets hot. Scout.com reports UMass is recruiting Bobby Solecki, a 5-10 180 pd WR/K from Glastonbury, Ct.
Solecki holds offers from UConn and Yale. Besides UMass he is receiving interest from Maryland. Matty V. has some factoids from Phil Steele's FCS Preview Magazine. The CAA blogger has some info about Steele's CAA predictions and shows UMass as #23 preseason. More on the CAA's Media Day. Tyler Holmes and Julian Talley will attend as well as Coach Morris. Sean Shapiro of TSN has a column on FCS programs on the upswing in 2011. The list includes Rhode Island. Condolences to the Kraft family on the loss of Myra Kraft. It sounds like she was a wonderful woman. Jeff Thomas has the start times for UMass' home games plus news on CAA Media Day. More from the UMass Athletic Web site. Matty V. also has a short article here. The CAA blogger has more on ESPN 3's coverage of the CAA's Media Day. The Richmond Spiders are hoping for a healthier year than 2010. 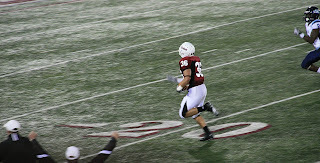 Sean Shapiro says the 2011 Big Sky Conference belongs to Eastern Washington. I saw this link over on the "Eagle in Atlanta' Blog: The Hottest College Affinity Credit Cards. Boston College fans are big spenders. The Ivy League will sharply reduce the number of full-contact practices to reduce head injuries. Rivals.com report UMass is interested in Brendan Quinn, a 6-2 220 OLB from Pawling, NY. Quinn's Rivals page is here. He's also receiving interest from Boston College, UConn and Syracuse. Jeff Thomas looks at Tyler Holmes chances for the Buck Buchanan award. Craig Haley of TSN has the original article here. Matty V. has a blog post about Holmes here. UMass' switch to the 3-4 should help free up Holmes to fly around and make plays. That should help him in the voting. The CAA Blogger looks at the three CAA defensive players on the list. NESN mentions the Minutemen's last season in FCS. The ACC Sports Journal looks at Boston College's lack of buzz and mentions the Minuteman Mania when John Calipari took UMass to the Final four. Future CAA team Georgia State is having a rough summer. DailyPress.com reports UMass has offered to Donnell Lewis, a 5-10 160 pd DB from Newport News , VA.
Recruit757.con says he's looking forward to visiting UMass. YouTube junior highlight video here. 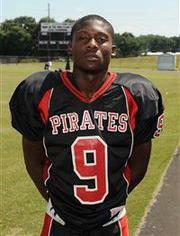 Besides UMass, Lewis holds offers from ODU and VMI. This ESPN article talks about the "magic" of a Boston sports bar, which happens to be owned by Peter Colton, who played some QB for UMass back in 1975. Miami, Pitt, USF, San Diego State and Tulane all play their home games at NFL Stadiums. Skip Holtz thinks it's time for USF to build their own stadium. Good luck with that given the current economic climate. Brandon London had 6 catches for 82 yards against Toronto for the Alouettes on July 15th. He had one catch in his first game against BC, three against Saskatchewan and now six in his last game. The College Football Hall-of-Fame will be moving to Atlanta, GA in 2013. Matty V. has a blog post about a Rhode Island article saying that the Sept 17th Minutemen-Rams game will be on Comcast TV. With UMass moving to the MAC and Rhode Island cutting scholarships and dropping down to the NEC, this will probably the last meeting between the two schools. The series began in 1903 and has been played 85 times---the most of any UMass opponent. The Minutemen hold a 47-36-2 lead in wins. He also has a blog post about Arizona offering its fans a chance to play NCAA Football 2012 on its stadium video board and speculates about doing the same thing at Gillette. This article mentions former AIC AD and UMass player Bob Burke. 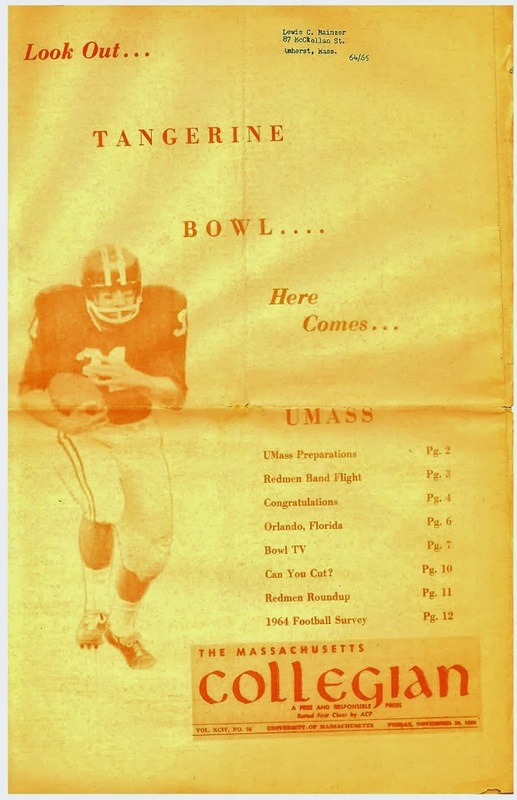 He won letters for the Minutemen in 1962, 1963 and 1964. The Gazette has a story about the UMass Police Mounted Patrol and mentions their sometimes use at McGuirk. In that case, we have UMass police sitting on horses watching the traffic jam as opposed to having UMass police standing on the sidewalks watching the traffic jam. Sean Shapiro of TSN's "In the FCS Huddle' talks about FCS Presbyterian (enrollment 1,200) playing at PAC 10 California (2010 undergraduate enrollment 25,240). Syracuse's Jim Boeheim reacts to Rick Pitino's proposal of breaking the Big East into two divisions, one with all the FBS football schools and one with the basketball and FCS football teams. The original comment from Pitino was on his blog. 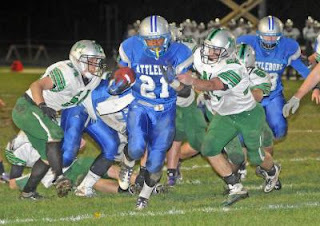 This article from the WiltonVillager.com features UMass 2012 recruit Ryan Phillips. I've blogged about Phillips before. The BC Blog "BC Interruption" thinks UMass and BC will agree to the Eagles 2-for-1 series offer starting in 2016. Craig Haley of TSN ranks the FCS conferences for 2011. Lebanon, NH OL Alex Morrill is being told at 6-2, he's too short for DI football. Too bad they can't measure the size of the kid's heart. 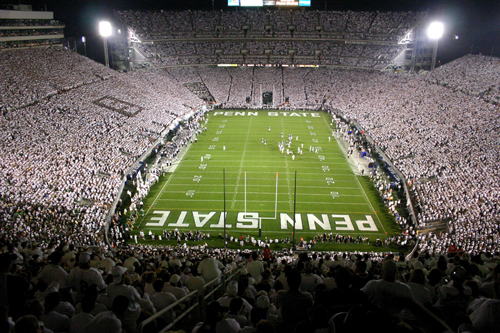 Penn State will play two MAC teams in 2015. Note that Temple-Penn State will be played at Lincoln Financial Field in Philly. The NCAA dropped the hammer on Georgia Tech yesterday. ESPN Boston reports UMass is interested in Preston Cooper, a 5-7 170 pd athlete from Boston College HS. The Boston Globe asks Cooper five questions. Besides UMass, Cooper is drawing interest from FBS schools Boston College, Penn State and UConn. At the FCS level Maine, UNH and Rhode Island are all considering him. This article features Victor Cruz and the problems he overcame to become an outstanding receiver and a member of the NY Giants. 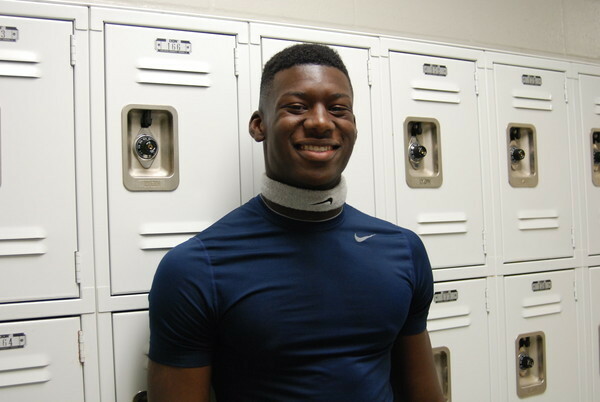 Jakarri Thomas, a 6-2 180 pd OLB from Talahasse, FL has verbaled to Arkansas. He chose the Razorbacks over UMass, Vanderbilt and Maryland. I've blogged about Thomas before. Our soon-to-be conference mates Buffalo will face Penn State in 2015. Add Beaver stadium to the list of places I'd like to follow UMass to sometime. UMass has a chance to vote for the UMass "Performance of the Year". Tyler Holmes' two TD interceptions is the option I'm voting for. Rivals.com reports UMass is interested in Darius Holliday, a 6-3 178 pd Safety from Jacksonville, FL. 1st Coast Gridiron player profile of Holliday. Holliday holds offers from Elon and Florida A&M. A Bleacher Report guy list Boston College as one of nineteen "weirdest schedules". Speaking of the Eagles, "BC Interruption" says losing to UMass would be unforgivable. In more Minutemen-Eagles interaction, Donovan Henry a 5-11 185 pd DB from Catholic Memorial chose BC over an offer from UMass. Henry was two-time All-State in track. Delaware lands a transfer LB from Auburn. The CAA blogger has a piece on three league players on the preseason Walter Payton Watch List. UMass fans will get to see the Minutemen play all three. He also has a story about Rhode Island center Matt Greenhalgh who, while rehabbing from an injury, also became a bone marrow donor. Matty V. blog has more on UMass helmet choices. He says the Minutemen Athletic Dept is definitely thinking of a uniform change for 2012. Richmond's (and USC transfer) Arron Corp will be playing his senior season for the Spiders. He's coming off a serious knee injury. UMass will be on the road at Richmond on October 29th. University of Maine sophomore Charles Kyeremeh was killed in a motorcycle accident on Sunday afternoon. The NY Times reviews EA Sports NCAA football 2011. Just think, next year UMass will included! EA Sports NCAA Football home page here. I've never been a big gamer, but I'll have to get the 2012 edition. The FCS Payton Award Watch List is up. Former Patriot LB Mike Vrable has joined the football staff at Ohio State. Rivals.com reports UMass has offered to Vin Ascolese, a 6-2 215 pd OLB from North Bergen, NJ. 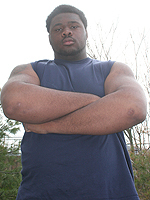 Ascolese had 90 tackles and 5 sacks in 2010. He was first team All-conference, 2nd team All-State. YouTube highlight video here. More stats on Ascolese here. Besides UMass, Ascolese holds offers from Buffalo, Illinois and Temple. Brandon London had 3 catches for 47 yards in the Larks 39-25 win over Saskatchewan Saturday. University of Buffalo's AD Warde Manuel is starting the change the culture of athletics at the Bulls. The NCAA is loosening the rules about celebration this year. A GatorSports.com writer looks at five stadiums to visit. Surprisingly, UMass has played in two of them. Three stadiums the Blog would like to visit with the Minutemen would be Autzen (the blog's sister lives in Eugene), Memorial Stadium and Tiger Stadium. Where would you follow UMass now that we are FBS? The UMass website has the preview page for October 8th's game with Central Conn State. CCSU tied for the NEC championship in 2010. Article on their recruiting here. UMass preferred walk-on Ryan Phillips will play in the Hall of Fame Football Classic in West Haven, CT.
Andrea Adelson of ESPN's Big East Mailbag answers a question about UMass joining the Big East. As she says, we need to win in the MAC if we want to think about Big East in the future. Delaware's Andrew Pierce makes ESPN's Top 10 non-FBS-players list. Former UMass WR Jeremy Horne gets a mention in this article on the Kansas City Chiefs. Model Larissa Roquelmie says she will strip naked if Paraguay wins the COPA America Tournament. As Radar O'Riley would say ,"I don't think nekkidity is a stranger to Ms. Roquelimie." Rivals.com reports UMass has offered to Tyrique Jarrett, a 6-3 320 pd DT from Pittsburg, PA.
Jarrett holds offers from Pittsburgh, Akron, Cincinnati, UConn, Hampton, Norfork State and Temple. Thanks to the commenter who alerted us that UMass has the revised 2011roster up. It includes the recruits. A couple of weeks ago, they updated the coaches roster. It's all here. 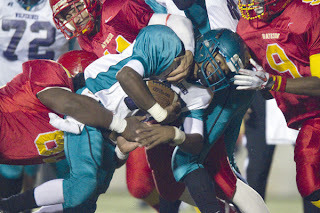 Jeff Thomas has a look at three recruits UMass is interested in for 2012. I'll be covering all of them in detail later. I was looking at the Rivals page yesterday. Matty V. has two posts about a possible new look for UMass football uniforms and helmets as we enter the FBS level. This is his original post and one response. I liked the all-white road uniforms. I thought UMass looked fast in them. The only time I can think of that we used the all-whites was in the playoffs. I also liked the classic "UM" helmet. Sorry Matt, but I don't like any of the helmets in the article. This article looks at conference realignment. It says what I have been saying here for years: that the it is only a matter of time before the Big East splits with the Catholic basketball schools. The MAC Blog "Hustle Belt' looks at the Temple-is-leaving-the-MAC rumour. Former UMass punter CJ Keogel is still involved with reality TV and is also doing some coaching. BC Blog "Eagle in Atlanta" has this link to a review of the Eagles schedule, which includes UMass. Speaking of Boston College, they've just completed a renovation of their strength facility. One of the criteria Phil Steele uses his "Going up and Going Down' feature in his magazine is turnover margin. Teams with high turnover margins tend to slide the next year as they don't get as many breaks. Team on the wrong side of the turnover margin tend to do better as the opposition does not get as much help. Steele's criteria would seem to indicate Delaware, New Hampshire, William & Mary and Villanova might drop this year. JMU, Richmond and UMass could benefit from a better turnover ratio. Doing better on turnovers probably won't do much for Towson. The official NCAA notice that UMass has been approved to move from FCS to FBS. Note that the University of South Alabama and Texas State-San Marcos are also making the jump. I had heard of the South Alabama Jaguars, but I had forgotten about the Bobcats. Jeff Thomas looks at the rumour of Temple going to the Big East. Interesting that at least four of the Temple recruits started the rumour. I don't see how Temple could have told recruits they are moving prior to any actual invitation. That's gotta be a NCAA violation of some sort. Bob Caret, the new UMass president, is a big guy and a big supporter of athletics. This New York Post story says Vladimir Ducasse is a "lean" 345 pounds. A lot of NFL assistant coaches are moving to college football. Rivals.com reports UMass has offered to Trey Dudley-Giles a 5-10 170 pd Athlete from Dade City, FL. This article gives his 2010 stats. He holds offers from Ball State, East Carolina, Eastern Michigan and Rutgers. Matty V. has more on the Temple-is-leaving-the-MAC rumor. Note that if the Owls leave the MAC, UMass has a reduced leaving penalty. People have been telling me UMass goes where Temple goes in order to maximize the Boston-Philly market leverage. The Agganis All-Star game will be July 14th. At least one player will be playing, and will be attending UMass, but without any connection to football. Josh Buchanan has a preseason All-American team up. Tyler Holmes is the only Minuteman to make any of the teams. "Eagle in Atlanta" ranks UMass as #8 in importance in BC's 2011 schedule. Mrs Blog and I would like to wish everyone a safe and happy Fourth. Hope you're having a nice weekend. One football story: there has been some talk on various message boards about Temple leaving the MAC for the Big East. The College Football Examiner takes a look at that. On a holiday-related note, the Wall Street Journal has a story about one of the families of a deployed soldier. 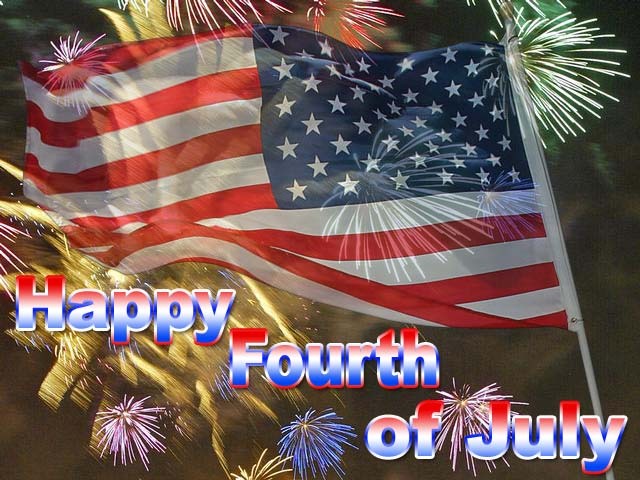 If you should see a World War II vet, make a point of shaking his hand, their numbers are dwindling. When I moved to Jaffrey in 2004 my next door neighbor was a WW II Navy vet. He was on the USS Chicago during the second of "Halsey's Typhoons". The storm ripped 120 feet of the bow off his ship. I was on a destroyer and spent some time in the North Atlantic, but I can't imagine a sea state that would rip a bow off a heavy cruiser. This WW II newsreel has film of the incident. My neighbor passed away a couple of years ago. ESPN Boston reports that QB Michael Walsh has committed to Brown. He chose Brown over Harvard, UNH and UMass. I've blogged about Walsh before. 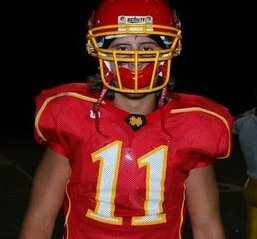 A Maryland blog previews Alex Twine, a LB who chose the Terps over UMass and some other CAA schools. Jeff Thomas has a short article on the BC Lions-Montreal Alouettes game I reported on yesterday. He mentions Sean Smalls as the only other Minuteman playing in the CFL. Off topic: Kentucky gives John Calipari a $36.5 million contract extension. Craig Haley of TSN has a column about CAA bottom-feeder Towson. "Eagle in Atlanta" blogger says Boston College will likely have new uniforms when we play them this fall. Why I never go the the big city. The Terror Clowns of Manchester. UMass season tickets are available on-line. The UMass website says season ticket holders will get a "special benefit' next year at Gillette. I kinda screwed up mentioning the Montreal Alouettes- BC Lions game yesterday. Besides Brandon London starting for the Larks, Antoine McKenzie and Keron Williams started for the Lions. The Alouettes did not throw to London much. He had one catch for 9 yards. London had a first down reception nullified when the guy blocking Keron Williams was called for holding. McKenzie had 5 tackles and a pass breakup. Keron had 3 tackles. Game story here. The Boston Herald reports that QB A.J. Doyle has verbaled to North Carolina State. I've blogged about Doyle twice before. Matty V. has a blog post about Coach Morris' promotional tour in Worcester. CBS Sports reports the SEC is pushing for some major changes in recruiting rules. Craig Haley of TSN has a story on "Spoilers and Upstarts" in 2011 FCS football. Athlon Sports looks at winners and losers in College Football expansion. Mentions Villanova in the "losers" category.